Late March 1989. 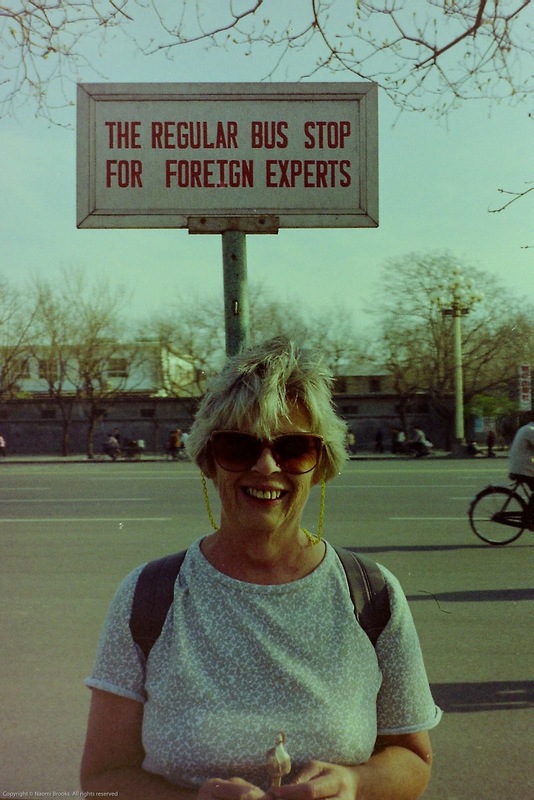 Mum and I arrive in Beijing on an early morning flight from Xian. Our local guide fails to pick us up from the airport so we take a taxi in to the city, find the back street operation that calls itself our tour agency, and amuse ourselves watching a man wash his hands with soap, water, then dirt! Hmmm. 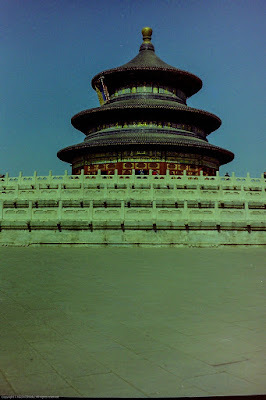 Soon we are off to our hotel, situated south of the CBD on the road to the Temple of Heaven, where we spend the rest of the day waiting for our local guide to get his act together and arrange our itinerary. 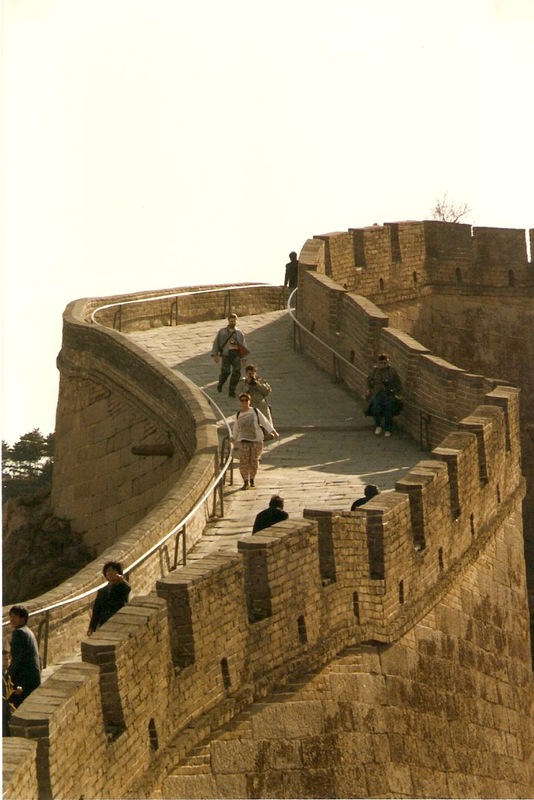 We have caused considerable confusion by tacking on an extra 4 days to our stay in Beijing, four days when we won’t have our lives ordered by fitting a limited amount of sightseeing in around sumptuous banquets at every meal. We will be free agents, something the Chinese authorities haven’t quite got their heads around yet. 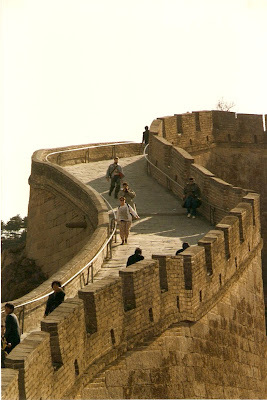 Our first day of sightseeing we tackle the big-ticket items: a trip north of Beijing to the Ming Dynasty tombs and The Great Wall. I am suitably impressed by both structures, but not by the appalling sanitation and the need to bribe policemen in order for our driver to proceed. We return to Beijing tired, in desperate need of a toilet that doesn’t smell like a sewer, and a little poorer. Day 2 we tick off a few more items on the bucket list. First up is Tiananmen Square where we line up to traipse past Mao’s embalmed body laid out in his mausoleum. 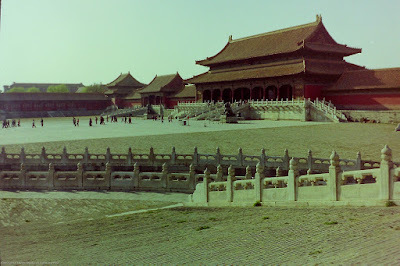 Then across the road to The Forbidden City for a whirlwind tour through it’s many halls and palaces. We are in a hurry, because it’s soon time for lunch, yet another excessive banquet washed down with local beer. I have been enjoying the local beers though! After lunch it’s off to The Temple of Heaven, which is truly a beautiful place and we vow to return there once we have more time on our hands. But next it’s off to The Friendship Store, before dinner and a visit to the International Club for an acrobatics show. Those kids are amazing, all that balancing of crockery and bodily contortions. The Friendship Store was a Chinese institution back in those days, because it was the only place you could purchase goods using Foreign Exchange Certificates, or FECs. Goods sold in The Friendship Stores were considered better quality, so could be sold to foreigners without fear that they would fall apart within minutes. Friendship Stores also sold foreign goods, so Chinese people were very keen to get hold of FECs so they could buy a TV or some other highly sought after electronic equipment. Which meant there was a flourishing black market. Fast forward 20 years and now pretty well everything is made in China and exported to the world. Needless to say, Friendship Stores and FECs are a distant memory. Our third day we venture out to the Summer Palace, before spending a couple of lazy hours strolling through some of the parks surrounding the Forbidden City. That evening we dress up to go to a posh restaurant to eat Peking Duck. A proper meal consists of making your way through various dishes comprising all the duck’s innards before the main course of crispy skin and meat wrapped up in a crepe with spring onions and plum sauce. And that’s topped off with a hearty duck soup. Very nice! Day 4 we say goodbye to both our guides, breathe a huge sigh of relief and head off on our own. A bus and a subway ride away we arrive at the Tibetan Lama Temple and are overjoyed to see not only a working temple, but also a lack of tourist crowds. After a wander around here, we head off by foot through hutongs, and stop for a while at a Confucian Temple with a small archaeological museum and a map of the old city walls. 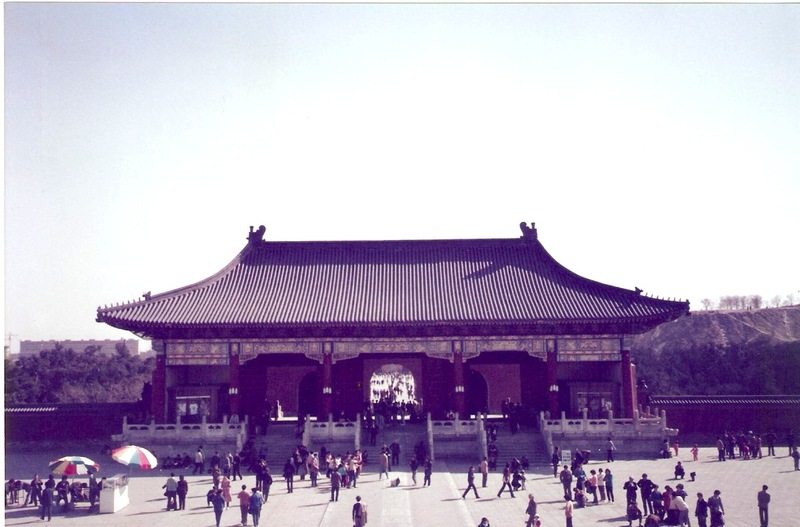 Even in 1989 there was little left of the old Beijing, and hutongs were rapidly being destroyed to make way for new modern buildings. With their decrepit courtyard houses and appalling sanitation it wasn’t a surprise, but it’s always sad to see a city losing its architectural heritage. Back on the main drag we visited both the Bell Tower and Drum Tower, before heading down through Coal Hill Park to the shopping district of Wanfujing Lu. Next we hit the evening food markets along Changan Avenue, using our black market Renminbi to sample the local cuisine. Noodle dishes, dumplings, fried sparrows on sticks! Even ice cream. Failing to find the right bus stop, watching numerous bus 39s pass us by without stopping, we trudge our way back to our hotel. Exhausted, we scrub half a hill of dirt off our faces before heading to bed. Next day we decide to visit the Temple of the Reclining Buddha, which is in outer Beijing. 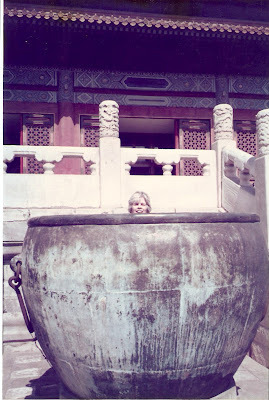 This involves taking a bus into town, a trolley bus to the zoo, another bus to the Summer Palace then a final bus out towards the Botanic Gardens, before walking down a dry dusty road to the temple. Although not a working temple it was in a pretty setting amongst gardens and pagodas. The trip back, however, was a nightmare, where aggressive use of elbows was the only way to get onto the overcrowded plethora of buses we needed to get back to town. After another meal of snacks at the night market we opted for the shuttle bus back to our hotel from its sister hotel closer to town. We have enough time for a lazy cocktail whilst waiting for it to leave. Day 6 we return to the Forbidden City, now experts at wielding our elbows in the fight for a seat on the number 39 bus in to town. We enjoy an entire day wandering around through the various rooms, collections, gardens and relics that still remain. Although many Chinese imperial treasures were taken to Taiwan by the Kuomintang when they lost to the Communists, there was still a lot to amuse us for hours. And without the pressure to head off for a sumptuous midday banquet we enjoyed a quiet picnic in the Imperial Garden and continued our sightseeing. That evening we decided to try Peking Duck again, this time opting for a less opulent restaurant where the clientele were all local, some of whom spoke English. We shared our table with one young couple who worked at one of the big hotels, and were complimented by others for choosing to frequent their local eating establishment. And the food tasted better too. Our second last day in Beijing we go shopping. Dazhalang Hutong was a maze of shops selling all sorts of products at cheaper prices than the market stalls near the tourist sights. The nearby hutongs were in a dire state of disrepair, frequented by rag and bone men on tricycles and mangy cats. From the main Post Office we take a subway to the Beijing Observatory, a museum of instruments once used by star gazing Jesuits, before wandering through a few more shops and markets, changing some money on the black market, snacking on street food and indulging in overpriced cocktails back at the hotel. Our final day in Beijing we visit the Post Office to send off some of my purchases. As I was heading off through South East Asia and not heading home with my mother, we decided to send home some of the heavy books we had bought. Rather than burden mum with the extra luggage, we decided to brave the bureaucracy of sending a parcel overseas.